"Hey Ashoka, thank you so much for the healing session last night. I woke up feeling fantastic this morning – something that hardly happens. It really does feel like I’ve been reset. My heart feels amazing is all I can say. I really want to express my gratitude to you – thank you for everything. The world is lucky to have someone like you, and for me personally, it’s inspiring. I don’t know what you’ve done with me but I believe that going forward I really need to protect this sacred space. Thanks again man!" "Ashoka is a very dedicated and hardworking healer who is well versed in various healing modalities. He is down to earth and is very friendly and easy to approach. My own akashic reading/oracle reading/scanning of chakras is quite accurate as it matches and complements with what other competent healers overseas and my higher self have told me or indirectly shown me before. His healing is very much in tune with both tradition and new age, and is more focused on moving beyond duality and being in harmony and at One with the Universe. I would recommend to people who wish to experience more joy and peace in our busy lives and who consider being more attuned to our spiritual nature." "Hey Ashoka I am so happy. I think your clearance of my blockages worked. For many months I didn’t win 4D. Today I won 1st prize and although not a lot but it works. I am so happy; I was initially ‘do and try’, now it proves you have helped me. How can I thank you? I am really so happy… I sincerely felt bliss to trust my intuition to go ahead to meet you. You’re like my angel hahaha…"
"Thanks for the report and for the amazing chakra-tuning and more. Surprisingly, I felt more energy immediately after yesterday's session and also today. It was an eye-opening experience and felt that you undertook the whole process very professionally & smoothly. Thank you also for your friendliness and warmth in sharing with me your wisdom and for answering any questions I had." I have in the course of my life met many healers who have touched my life and prepared me for my realisation, of what was to come. You were the one final person I needed to see channelled to me without even my knowing to do the final “crescendo” to awaken me. Angels guided you to me. I think I have told you in person that after your Akashic reading and eclectic chakra balancing, an OBE experience amounting to a Kundalini arising became apparent to me, hours on. Ashoka, you have no idea that our first meeting was the day I finally ‘awakened’ to my energy. Others have, yes, done their work on me, but your work was the final straw that broke the “camel’s back”. Your continuous, unselfish guidance and friendly re-assurance has given me faith and courage to accept my spiritual gift that I was always doubting and de-bunking. Anytime I had doubts, worries, surprises you never failed to encourage and inspire me further to trust, trust, trust. Today, I do not doubt anymore. I am forever blessed with this “gift”. May you always do God’s work... God bless. “Ashoka has an endearing personality and puts people at ease. It was an eye opener to have him work on me. He uses a wide array of tools in order to facilitate the balancing of the chakras. From colours to bells, crystals to breath. It was an interesting and enjoyable experience. "Certainly a session that I will never forget. It felt like a 'reset' to my body's wellbeing and I had a new, reborn feeling after the session. Highly recommended for anyone who wishes to have inner peace and mental strength in everything you do. Not something I can explain, but only you will be able to experience. Plus, Ashoka is probably the nicest guy I ever met with the deepest sincerity in what he does! Thanks once again Ashoka! Highly recommended to anyone!" "I received Ashoka’s Eclectic Healing session. As a recipient all I did was to be comfortable and receive. I drifted in and out throughout the session. I was told by Ashoka that he worked on my chakras. Symbols, bells and toning. I enjoyed the energies that I received from all these tools. What I realized was that he uses his own natural voice to create a soothing soundscape for our session. I find this very soothing and quite unique. At the end of the session I felt very relaxed and grounded. What I found delightful too was being invited by Ashoka to experience a shamanistic ritual of space cleansing and protection before I proceeded to lay down to receive the healing. This to me symbolizes my taking responsibility and giving permission for my healing journey. Thank you Ashoka for this unique healing experience. I would recommend others to receive Ashoka’s Eclectic Healing sessions." "Absolutely amazing. Very eclectic and calming session. Felt, saw and heard the different eclectic energies and felt more balanced and relaxed after the whole session. Ashoka conducted the entire session to perfection, truly an all encompassing and eclectic experience." "I had an eclectic chakra fine-tuning session with Ashoka Healing last week and the least I can say is that it was wonderful. Ashoka is a powerful Shaman and healer. This modality that he created is to me what I would call alchemy healing and a harmonizing. Each step of the process, coloured pieces of fabric, crystals, tuning forks, light language, codes... Creates a massive but gradual stream of powerful energies to flow through your being. The stream of energy is very strong and very gentle at the same time, I felt I was in a cocoon. Feeling more at balance, relaxed (I feel asleep at some point and was snoring), getting my chakras spin at optimized speed, getting also clearing and also a great reconnection to my inner power with the work he did on my solar plexus and my Heart. I really recommend his sessions, please book and have a try... You body, soul and mind will thank you." "Amazing stuff, the crystal/card/sound healing really puts you in a good space and clears your mind." "Being an Empath & someone who is sensitive to different energy vibrations, I could instantly feel a tingling sensation flowing through my body, especially when you were chanting the mantras to bless the different corners of the room. As we progressed on with our session, I could feel different chakra points being worked on, especially my solar plexus, heart and third eye chakras. I feel a sense of calmness and I know instinctively that I am in good hands, when you were performing the healing session on me. I truly enjoyed our healing session today and I do personally believe that this is a calling for you to be a healer." “It is one of the most blissful healing session I have experienced! Ashoka with his well-integrated spiritual tools, is able to lead me into a deep relaxation state. I felt that I've entered into another dimension and trusted that my deep issues of grief, anger and self-hatred and feeling of incompleteness are being cleared and cleansed. I love the sensation of the tuning forks on my body. The vibration ease my body tension and allow me to feel so comfortable in my body! I felt the crystals put all over my body to be very pure and healing. And the coloured chakra cloth on my body allows me to be in touch with my inner self. And I really like the way you clear the space, calling upon the Nature Elements/Spirits to be with us before we start the Healing session. I feel very supported and surrounded by the higher spirits! Thank You Ashoka for this very impressive and colourful healing session!" "My session with Ashoka was a deeply restful and beautiful one. An alchemy of elements were used for a well-rounded and colourful experience. Cloth correlating to the hues of our chakras were placed as a form of colour therapy and to activate and heal them. Sound in the form of intuitive mantra chanting, tuning forks and vocal toning also added to the aura-somatic experience. Crystals and cards with light symbols were respectfully placed to increase the frequencies and energy while Reiki and Pranic healing enabled me to sink into a semi-awake state of consciousness that facilitated my therapy with Ashoka. "As a holistic healer and spiritual practitioner myself, I am naturally more selective about who I receive an energy healing from. I instantly connected with Ashoka and felt very comfortable to trust and place my well-being in his good hands. Ashoka's mix of various shamanistic healing techniques was refreshing and uniquely his own. I felt immense energies coursing through my being during the session and was it felt so pleasant that I did not wish it to end. Thank you Ashoka." Many thanks for your readings. What I like most about your reading service was your sincerity and positivity. I sense your sincerity in wanting to provide the service and you were quick to recommend and share beyond what I had asked - e.g. about the meditation centres in Singapore, etc. As I asked you further, I realized you took more effort in your readings by consulting several decks of cards as well as the Akashic readings. Your service was sensitive, prompt and very helpful. Positivity and cheerfulness is one of your traits too :) Most of what you wrote makes sense to me, although I hardly revealed much information beyond the open ended questions. Thank you Ashoka and all the best in this journey :)"
"Ashoka had done an Akashic Reading for me as I was having anger and resentment issues which had caused my some physical issues in my abdomen for number of years. He had accurately conveyed to me the causes as well as how to heal as well. He so understood and came from a place of non-judgement. He displayed qualities of empathy. He had not just advised me on a practical level but had also done an impromptu prayer and energy healing where I had felt an energy shift. I am very appreciative of his healing and highly recommend him to anyone in need of clarity of their situation and healing thereafter." "It was a wonderful experience, something which I had not experienced before. It was good knowing about me in a different light and exploring my life." "I cannot help it but to gloat over Ashoka's help. Through his session of Akashic records I got my answer to question which was lingering for a year. As soon as he revealed the answers via whatsapp I had goosebumps and started tearing and I am sure that it was my soul that was crying in joy, his reading resonates 100% accurate. Thank you once again Ashoka, for being helpful to get my answers." "The first time I met Ashoka, I felt his kindness and good intentions. It brought me to contact him in order for him to access my Akashic Records and get some clarity in my situation. He was very accommodating as he came over to my place to do the session. His reading was very very very accurate and really helped me get understandings of how my past lives impacted on my present life. He gave me answers on questions I kept in my heart for years. He accompanied his readings by powerful prayers that help releasing past lives energies and to help forgive. There is no doubt Ashoka is gifted and will continue to grow spiritually; Ashoka has insights that breathe truthfulness and wisdom. I highly recommend his Akashic Records Reading and can't wait to try his Eclectic Chakra Fine-Tuning!!" "I have had a reading with Ashoka, and I am amazed by it. Ashoka is not only sensitive in his reading but he is also able to connect deeply with your soul and provided a detailed and sensitive reading. Apart from this, he has also provided powerful prayers for me to release my old energy cord. I was emotionally shaken after reading his findings and it just touches me. I will recommend Ashoka's reading to people who will like to find out about their challenges in life." "I am deeply grateful Ashoka answered my questions at this time of anxiety and need. His clear insight brought me understanding and comfort to my current journey by providing practical wisdom and compassionate solutions. He is prompt in responding to your requests with respect and a genuine desire to help. His empathic abilities and knowledge in connecting to the energy world is commendable. I was impressed with the comprehensiveness and depth of his reading and it even touched on a past life which I had experienced myself! His reading included much more than I asked for, including glimpses into my past life, spirit guides, recommendations of crystals and identifying my strengths and reasons behind my dilemmas. I would highly urge you to have a reading with Ashoka if you desire to shed light on your current issues and questions. He has guided me not just as a spiritual practitioner who is very balanced in his approach but also as a sincere friend who truly cares about your well-being." "I am very impressed by the detail and accuracy of the reading Ashoka presented! It was amazing and provided me with much needed peace of mind and clarity in regards to what I had to do! I look forward to experiencing Ashoka's other services in the future, and should this service ever be offered again (and I highly recommend it), I would definitely take advantage of it!" "I received an Akashic Records Reading from Ashoka today and I felt such love the moment I contacted him by email. It was the second question I had asked about a health concern which worried me the most and when he shared what he had read about that, I started sobbing from a deep place. I knew I was touched and I somehow felt that was what it had been all along. I could not have seen this on my own and I am so grateful. At last. His love and reassurance to keep on my path and to support me were the other gifts from this reading. I am so glad I received this reading today. Thank you Ashoka again…." "Hi Ashoka, thank you so much for the reading. I always had some questions in my head and I didn’t really know where to get the answers. And now I have gotten the answers through the reading! The reading was spot on and I feel blessed and grateful to know that I have guides guiding me along the way. I feel more positive now. Thank you for patiently answering all my doubts!" 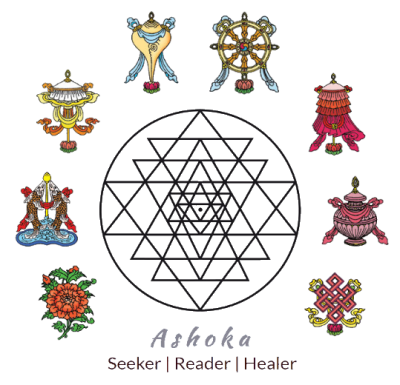 Ashoka is a compassionate, extremely dedicated and gifted intuitive healer. Connected deeply both to Mother Earth's energy and the Divine at the same time, he exhibits the full spectrum/dimension of the human/spiritual experience, and hence his ability/potential to touch the lives of many. His lightworking services are over-and-beyond. His spiritual leadership of fellow lightworkers and services to his clients bear testimony to his purity of heart, care, vision, resilience, strength and his generosity in spirit, delivered with his affable, personable, responsive characteristic traits, and his unique sense of humour. If you are guided to connect with him, I would highly recommend that you follow your intuition. :) Namaste. "I met Ashoka at the Heart Mind Body Festival in Suntec City and I was given a Chakra scan and advice on crystals. What amazed me was his ability to make the client feel at ease and comfortable. He genuinely connects with the client and you can feel his warmth. Further to it, his assessment of me during the scan was spot on and his advice on the use of appropriate crystals was really useful and shows his depth of knowledge in that area. I thank him a lot for his warmth and advice." "Hi Ashoka, just wanted to tell you that after attending your class, a guy that I have been contacting for awhile has asked me out and also I am getting to know another person through a mutual friend. I am not sure if either of them will be my life partner, but I am certain that this happened because of the release and healing done by you. This has happened after a long time so I’m glad that I attended your class. Manifestation really works!" "Dear Ashoka, you have a gift for tuning into the sadness in people, and that desire to melt away sadness in others motivates you into becoming a healer. Sadness to you is not just a negative emotion. It's a beautiful vessel that holds a person's most precious soul gifts. It holds the key to our powerful transformation. You can sense that. Highlight this in your offering and you'll attract the right clients for you. Love, Bingz." "Don't follow any advice, no matter how good, until you feel as deeply in your spirit as you think in your mind that the counsel is wise."